A reputation macro for Keeper Raynae. Takes 10% rep boost into account. With Racial - Human, AND any other 10% buff, e.g. WHEE! you get 90 rep each so need only 467 No. Please, for the love of god! IF u join a raid to make it go simpler, PLEASE contribute aswell, so tired of people joining just to leech when the mob has spawned! Such a good thing that u can do it in a raid, but when 10/40 fishes, shouldnt be like that! When saving up totem fragments to purchase the bobber and recipe be careful you don't end up giving her all your fragments because you've been doing that for the past few hours. Blizzard didn't have the common sense to prevent you from wasting fragments for rep when already at max level. Val'sharah - Loriathil - 53.72 - from the flight master head down the path to the right. When you get to the bridge she's to the left. It took me approximately one hour to reach 'Best Friend' with Keeper Raynae. I was in a large raid group (there were approximately 35 people in it on average.) There was zero downtime between fishing for the Corrupted Globule. This was done on my Human Rogue, so I did get a slight reputation bonus because of Diplomacy. Drag the macro icons to an action bar. The icons for the tool tips will be the default red question mark until you make your first catch. Then the icon will change to the inventory icon with the count. When you turn in Corrupted Globules or summon the Enormous Globule using the Disgusting Ooze, the count will go to zero but the icon will remain. If you're solo fishing when Something's Fishy is up, it's really useful to know whether you've caught a Disgusting Ooze because you can only have one in your inventory at a time. As soon as you catch a Corrupted Globule, the icon (with count) will replace the default icon. 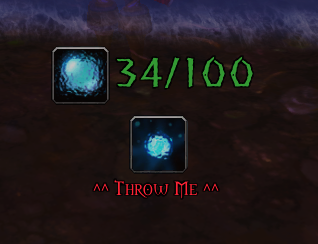 If you turn in Corrupted Globules, the icon will remain and the count will go to zero. Keep Arcane Lure up to increase your chance of catching bait that attracts rare Val’sharah fish. If you were leaving maxing out reputation with her for a Raynae day, you might want to get a move on. Since it will be a lot harder to find a raidgroup to maximize the uptime of the buff (and thus the ease of gaining reputation) once Battle for Azeroth releases. The watcher of fish in Val'sharah.